Acoustic tomography uses the travel time of sound in the ocean to measure the temperature of the ocean over large areas. 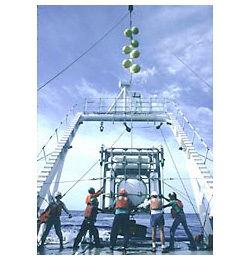 The Applied Tomography Experiment moored the source in the above photo just above the seafloor near Bermuda. Researchers listened for its transmissions on U.S. Navy receivers, as well as a receiver towed by a ship. With the data they collected, scientists were able to measure the position of the Gulf Stream. This is because the Gulf Stream separates warm Sargasso Sea water to the south from colder water to the north, and sound in the ocean travels faster in warm water than in cold water. For more information about acoustic tomography see How is sound used to measure temperature in the ocean? and Acoustic Tomographic Mooring. This sound source can be left in place for up to one year. A ship returns to recover the source once the experiment has been completed.